"Strength and stability are not variable but forever expressed in man." “Nothing less than a total interest in and dedication to God and His ideas would answer my need." Audio: Long-standing problem, quick healing! "This understanding leads us to a renewed vision of the divine and infinite good..."
“The goal of having children of our own seemed unreachable." 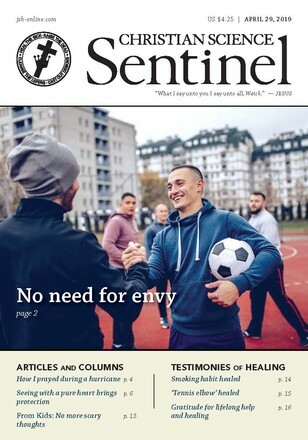 A weekly magazine that spiritually addresses issues facing the world today. A monthly magazine that explores the essentials of Christian Science healing and practice. Explore this month's content with our editors and readers. 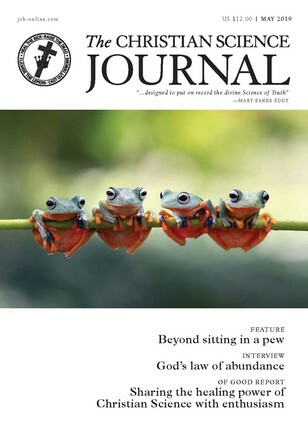 A monthly magazine sharing the practice of Christian Science with readers around the world. Share Christian Science worldwide – articles and testimonies available in 14 languages. Our guest today shares how he found fulfillment of a Bible promise that we are all rooted and grounded in divine Love. You can hear how, after years of suffering from an abnormal growth, our guest experienced an insight into the nature of God and the perfection of God’s creation that dissolved the problem overnight. An injury during a football game had this player wondering if he’d be able to join his team for its upcoming district match. But as he prayed, he gained a new conviction that he could be healed—without delay. The Christian Science magazines contain thousands of verified Christian Science healings and spiritual insights contributed by your fellow readers. Would you like to add your experience of healing or thoughts on Christian Science to the record? Submit your testimonies, articles, and poems here. March 15, 2019 | We are happy to announce the appointment by the Christian Science Board of Directors of Larissa Snorek, CSB, to the position of Associate Editor for the Journal, Sentinel, and Herald. She will succeed Kim Crooks Korinek, CSB, who has been working for the Christian Science periodicals with great love as an Associate Editor since the autumn of 2016. Each week, a new Christian Science Bible Lesson with passages from the Bible and Science and Health with Key to the Scriptures by Mary Baker Eddy offers practical, healing ideas on the primary themes of Christian Science. Tony Lobl, CS, from London, England. Tony is also an Associate Editor for the Christian Science periodicals. Explore Concord—see where it takes you. Search the Bible and Science and Health with Key to the Scriptures. You may download and print a copy of content for your personal, non-commercial use. You may download and print a sufficient number of copies of sheet music and hymn texts for the purpose of congregational singing, reviewing, and previewing hymns with your church congregation. You may download and play audio recordings for personal, non-commercial use and for the purpose of congregational singing, reviewing, and previewing hymns with your church congregation. Except for the above, you may not otherwise copy or distribute hymn content or other content from 2017 Hymnal pages in any format without written permission. All copies of 2017 Hymnal content must retain attribution and copyright notices as provided, without alteration. You may not email or re-post 2017 Hymnal content on other websites or social media pages. You may not deep-link to 2017 Hymnal content. For inquiries about re-using 2017 Hymnal content and permissions questions, please contact: permissions@csps.com. We reserve the right to terminate access to the Site and/or the 2017 Hymnal area of the Site for failure to comply with the above terms.